Libya’s AG has issued an arrest warrant for the LIA Chairman (Photo: Social media). 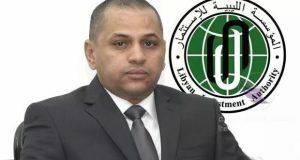 The head of the Investigations Bureau at Libya’s Attorney General’s Office, Siddiq Al-Sour, has issued an arrest warrant for Ali Mahmoud Hassan Mohamed, the chairman of the Libyan Investment Authority (LIA). There are unconfirmed reports that he was actually arrested on Wednesday. The Serraj government have made no official statement on the reports. It is reported that he is to be questioned for corruption. “The LIA is shocked by the allegations against Dr Mahmoud and his reported treatment today. The LIA is confident that Dr Mahmoud will be found innocent of all allegations. Dr Mahmoud and the LIA have been working hard to secure the assets and interests of the LIA for the benefit of Libya and the Libyan people”. “It is no coincidence that this has happened only a week before a court hearing in London involving Dr Mahmoud against individuals purporting to be the Chairmen of the LIA, namely Abdulmajid Breish and Dr Hussein”. Ali Mahmoud Hassan Mohamed is the appointee of Faiez Serraj the head of Libya’s internationally recognised Presidency Council and Government of National Accord. The LIA is Libya’s main sovereign wealth fund entity in charge of investments estimated at US$ 66 billion. Updated with quote from LIA spokesperson.